The award winning sellout concert promoters Cokobar are back again with two BIG events coming this August, both located at the HMV Hammersmith Apollo in London. Obviously, we Nigerians love a good laugh and no better way to end the Olympics with a comedy show from our very own Basketmouth on the 11th August of this year. 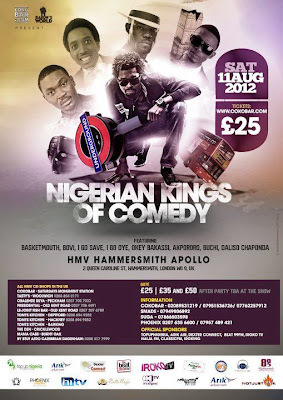 Bovi, I Go Save, I Go Dye, Okey Bakassi, Akpororo, Buchi, Dalso Chaponda and with entertainment from Choc City artist Brymo! Tickets begin from £25, make sure you get yours before they are all sold out! And if you are fund of Cokobar's events you know they get sold out FAST! Check out some of the hilarious skits below so you know what you're in for! Click the link below to find out more about the 'Love Afrobeats Festival'. As much as we love a good laugh, we also love a good concert! PSquare, Wande Coal, MayD, Ezi, EL, Fuse ODG and DL just to name a few. I for one will definitely be there as I love Afrobeats and a good get down! On the 26th August, all roads will lead to the Hammersmith Apollo in London as Afrobeat Lovers will be geared up for the event of the year! The baddest twins PSquare, Wande Coal and PSquare's artist MayD will all be headlining the Love Afrobeats Festival and it's hosted by non other than the hilarious Elenu all the way from Nigeria. And after last year's show, you surely DO NOT want to miss this years one! [Tickets also begin from £25]. Never attended last year? Check out highlights of what you missed and what you'll be in for again this year! 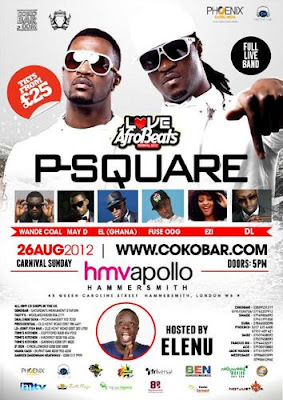 Follow: @Cokobar @PhoenixMediaUK @iamSMADE @AfrobeatsFestiv on twitter for more info.